National commercials under her belt including Spike Lees State Farm Insurance. Write-ups in New York NETWORK JOURNAL, Jazztimes, Jazziz, NYC Times,City Newspaper,Maxx Myricks's Maxx House , NYCHot House. Alpha Phi Delta. Has received active radio airplay. Performances with: Wycliffe Gordon,Clark Terry,Herbie Hancock,Dezron Douglas,Helen Sung,Wayne Newton, Performed with members of the Frank Sinatra Orchestra,Sabu Adeoyla, George Coleman,Russell hall,Sylvia Cuenca, & more. Recordings with:Jeremy Pelt,Steve Turre,Patience Higgins,Frank Lacy, Clark Terry,Reginal Veal,Ike Turner,Riza Printup,Taurus Mateen, and others. Background vocals with Freda Payne, Wayne Newton/and 30 minute solo, Billboard Entertainment Award show and the list goes on. Opened: David Fathead Newman,Kiss, Bill Withers,Donny Hathoway and more. Whitney features her abilites to play piano\sing & guitar at: Zinc Bar,Mintons Harlem,George Eastman House,St Peters Church Abey Lincoln Festival,Eastman School of music summer festival, Dusit Dubia Hotel and others. Rochester channel 8 aired Whitney Marchelle while teaching at Eastman School of Music. Televised airing also on channel 13 at the African American Festival with Tia Fuller. Nashville Network. Marchelle performed with bassist Sabu Adeyola and quartet at the Pine Grill Jazz Festival Reunion in Buffalo 2010. The Rochester Jazz festival with the Eastman music director Howard Potter big band, Drake University Big Band Jazz in July Festival Des Moines Iowa, Atlanta Jazz Festival,Black Arts Festival,Singapore Balloon Festival. Shared the stage with Dee Dee Bridgwater at the Art Deco Festival where Dee came on Whitney's segmanet and they did a duet it Don't Mean A Thing with Mustafa Big Band. 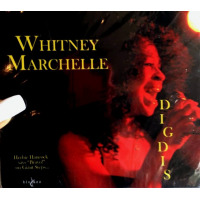 Whitney was a unexpected guest at the Killbourne Hall at the Xerox Rochester Jazz festival 2010 when called up on stage with the African Bassekou-Kouyate & Ngoni Ba group where they traded impromtu jazz & blues licks and received a standing ovation 2010. In 2008 a scheduled performance with the Musican Educators Big Band under the direction of Howard Potter for the Rochester Jazz Festival. Presidential, Olympic, and Grammy private events.Harlem Gospel Choir.Singapore Lighting of the Olympic Torch Festival,Balloon Festival Sentosa Island. She performed The Star Spangled Banner at the Chris Evert Tennis Classic. Tommy Banks Show, Tonight Show Hosted By Don Rickles. Fox Theater,Civic Center, NYC Aaron Davis Hall Theater acting/singing. ABC Superstars in Hawaii, Ilikii Hotel,Lenox Lounge,Rochester's NY Memorial Art Gallery w violinist Auga Davenport, Memorial Art Gallery w/Wycliffe Gordon & friends. Have been DISTIRBUTED BY CITY HALL RECORDS NATIONALLY Award recipient international recording singer/songwriter isbased out of New York City and Rochester NY and stamps you with her own style immediately. This smooth & straight- ahead jazz CD, Me, Marsalis & Monk, Engineered by Grammy winner Marc Useli and mastered by engineer Ken Depotter demostrates the art of composing 'in the moment' while performing an instantaneous level of creativity. Me, Marsalis & Monk features Grammy Award Winners REGINAL VEAL & NEAL CAIN - bass, . - arrangements & sax, Dan Nimmer - piano, and Barry Sames - piano among others. Me Marsalis & Monk CD and DIG DIS CD's available The CD Me, Marsalis & Monk wasrecorded in the following states; Pennsylvania, New York and Georgia. 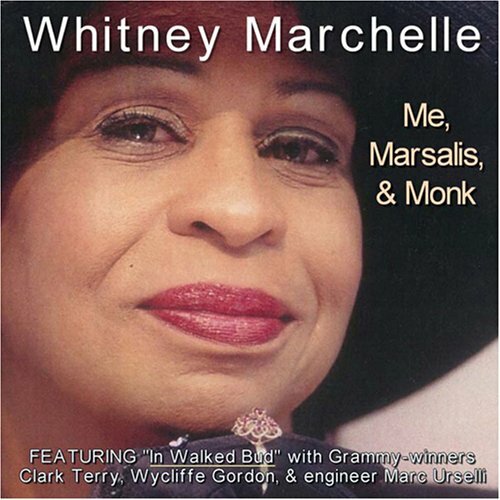 WHITNEY MARCHELLE aka Marchell Jackson wrote 6 tracks along with the words to Grammy Award Winner WYNTON MARSALIS's tune, LOOSE DUCK. The remaining 3 tracks of music by Grammy Award Winners Thelonious MONK and words by John Hendricks. WHITNEY MARCHELLE HAS ALOT TO BRING TO THE TABLE. A poet, theater & television actress but mainly a singer of 3 1/2 octaves with the ability to read music, attendeing numerous schools and Universites including New School Univeristy,D.M.A.C.C. Yamaha School Of Music, Kauffman School Of Music and Eastman just to name a few. Whitney grew up listening and listens to Nancy Wilson, Ella, Sarah Vaughn, Carmen, Nina Simone, Billy Holiday, Aretha Franklin, Mahalia Jackson, Bonnie Raitt, Chaka Khan, Barbra Streisand, Eddie Jefferson, Mel Torme, Pavoritti, Jon Hendricks, Ellington, Sinatra, Mark Murphey, Monk, Amrstrong, Stevie Wonder, Abbey Lincoln, Ray Charles, B.B. King, Natilie & Nat Cole, Clifford Brown, Clark Terry, Celia Cruz, Lorretta Lynn, Herbie Hancock, Miles Davis,Wynton Marsalis,Leona Horne, Shirley Horne,Coltrane, Pharaho Sanders and many more..
My clinics vary with ages from learning the voice and its functions, the do and dont's, how to project, to breathe, the melody, improvisation, the circle of fifths,knowing the music around us, (a door shutting what note was it, elevators notes, phone ring notes find them on piano)-identify; theory,excercises,scales,vibrato control, stage fright.Know your keys, how to talk to band members, the road map of a song. How to sing various styles to the same song. Demostrate and apply, listening to other accomplished singers AND musicians.Music in other countries. All About Jazz musician pages are maintained by musicians, publicists and trusted members like you. Interested? Tell us why you would like to improve the Whitney Marchelle musician page.